Has This Sell-Off Reached A Bottom Yet? Everyone wants to know if this sell-off has reached a low or bottom yet and what to expect over the next 30~60+ days. Since October, the US stock market has reacted to the US Fed raising rates above 2.0% with dramatic downward price moves. The latest raise by the US Fed resulted in a very clear price decline in the markets illustrating the fact that investors don’t expect the markets to recover based on the current geopolitical and economic climate. Over 5 years ago, we developed a financial modeling system that attempted to model the US Fed Funds Rate optimal levels given certain inputs (US GDP, US Population, US Debt, and others). The effort by our team of researchers was to attempt to identify where and when the US Fed should be adjusting rates and when and where the US Fed would make a mistake. The basic premise of our modeling system is that as long as Fed keeps rates within our model’s optimal output parameters, the US (and presumably global) economy should continue to operate without massive disruption events unless some outside event (think Europe, China or another massive economic collapse) disrupts the ability of the US economy from operating efficiently. 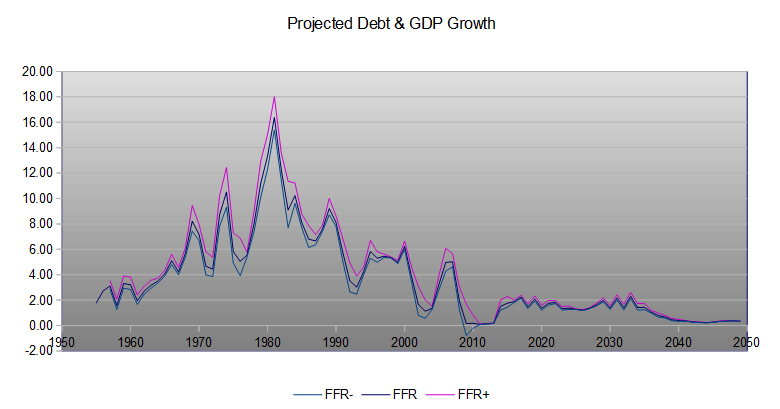 We’ve included a screen capture of the current FFR modeling results below.